The New Testament (Matthew, Mark and Luke) says that Jesus spent 40 days fasting in the desert after his baptism by John and before he began his public ministry. The three accounts also say that he was tempted by Satan there. Hence, Lent (literally meaning ‘springtime’) has been mapped out by the Church as the 40 days of Jesus’ fasting and temptation in the wilderness. This was first popularized in the fourth century. 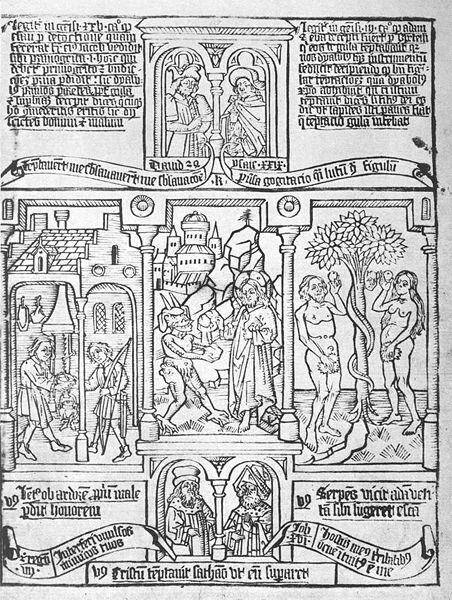 The ‘Christ Tempted in the Wilderness’ (c. 1470) from the Biblia Pauperum (Bible of the Poor), one of the most popular block printed books of the late Middle Ages, gives us a deeply biblical insight into this episode of our Lord’s life and offers a good way of contemplating the life of Jesus during this season of preparation for his death and resurrection. 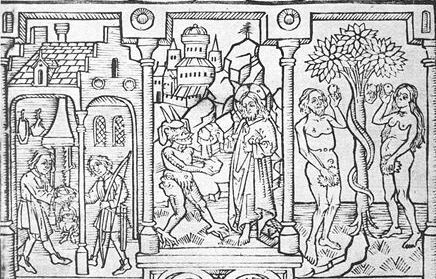 In the Biblia Pauperum ‘Christ Tempted in the Wilderness’ is flanked by two subjects from the Old Testament. On the left we see Esau selling his birthright to Jacob (Genesis 25:29-32) and on the right we see the temptation of Adam and Eve (Genesis 3:1-14). What do these three biblical subjects have to do with each other? Actually, that is the whole point of what the Biblia Pauperum is about in presenting Scripture. It is about helping us to see the Bible as a whole and make connections between the Old Testament/Hebrew Bible and the New Testament, without separating them, seeing how the Old is fulfilled in the New while affirming the history of Israel. It is about asking questions concerning what seems familiar to us from the Bible, along with an invitation to participate imaginatively in the biblical texts. Everything in these three panels is focused on food. Satan offers Jesus a rock to be turned into bread. Adam and Eve are offered the forbidden fruit. Esau, coming back from the hunt, is famished and just wants to eat, even if it means giving up his birthright. Matthew and Luke tell us of Jesus’ triple temptation by the Evil One: to turn stones into bread, to throw himself from the pinnacle of the temple so that angels would rescue him, and to worship him in order to have power over the kingdoms of the earth. The background of the middle panel suggests all three temptations are alluded to and remembered by the compilers of the Biblia Pauperum. The side panels focus on appetite along with the pride that plays a part in all three stories. One must actually know and understand the Bible quite well in order to appreciate the connections made by the Biblia Pauperum. It is not for the illiterate or ignorant, as is often asserted, as though ‘illiterate’ and ‘ignorant’ should be equated. On the left a warm kitchen is suggested. We see sides of meat hanging on the wall and a fireplace from which Jacob offers a succulent bowl of soup to his twin in place of his family seniority. Esau, still with bow in hand as he returns hungry from hunting, accepts. On the right we see Adam and Eve holding in their raised hands the forbidden fruit even as they attempt to cover their nakedness. They also lose their birthright and their privileged relationship with God. Their fall was not brought on by hunger, but by excess (often called ‘gluttony’ in former times) and pride. Although their sin was not induced by need, it causes deprivation for all humanity. The Bible of the Poor exhibits a remarkable tension between familiar and unfamiliar texts and images, inviting the viewer to explore the text from within. The book is an amazing structure for allowing ‘the word of Christ to dwell in [one] richly’ (Colossians 3:16). Every page has twelve components to watch by the hours of the day and its forty pages make it conductive to conscientious Lenten meditation, serving both spiritual illumination and inspiration to practical piety. Jesus stayed 40 days in the wilderness preparing for ministry. May we who feel lost in the desert of contemporary life take heart that we can bind our hearts to Christ and challenge our temptations by having Scripture deeply embedded in our hearts and minds. Laurel Gasque, ‘The Bible of the Poor: An example of Medieval Interpretation and its Relevance Today,’ in Imagination and Interpretation: Christian Perspectives, edited by Hans Boersma, Vancouver: Regent College Publishing, 2005. Avril Henry, Biblia Pauperum: A Facsimile and Edition (Ithaca: Cornell University Press, 1987) is the best hard copy source and contains full annotations. More readily available is The Bible of the Poor [Biblia Pauperum]: A Facsimile and Edition of the British Library Blockbook C.9 d.2, with translation and commentary by Albert C. Labriola and John W. Smeets (Pittsburgh: Duquesne University Press, 1990). Laurel Gasque is Associate Editor of ArtWay and the author of Art & the Christian Mind: The Life & Work of H.R. Rookmaaker.